Kalaee, Mohammad Javad. (1394). The preventive role of Snell’s law in mode conversion from Z- to whistler-mode waves in an inhomogeneous magnetoplasma with a low density. مجله ژئوفیزیک ایران, 9(5), 72-80. Mohammad Javad Kalaee. "The preventive role of Snell’s law in mode conversion from Z- to whistler-mode waves in an inhomogeneous magnetoplasma with a low density". 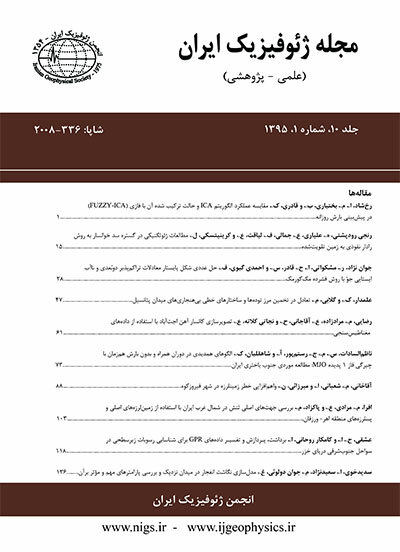 مجله ژئوفیزیک ایران, 9, 5, 1394, 72-80. Kalaee, Mohammad Javad. (1394). 'The preventive role of Snell’s law in mode conversion from Z- to whistler-mode waves in an inhomogeneous magnetoplasma with a low density', مجله ژئوفیزیک ایران, 9(5), pp. 72-80. Kalaee, Mohammad Javad. The preventive role of Snell’s law in mode conversion from Z- to whistler-mode waves in an inhomogeneous magnetoplasma with a low density. مجله ژئوفیزیک ایران, 1394; 9(5): 72-80. Electromagnetic waves with different modes, such as Z-, whistler-, LO- and RX- modes are found in different regions of the Earth magnetosphere and the magnetosphere of other planets. Since whistler-mode waves influence the behavior of the magnetosphere, and they are used as experimental tools to investigate the upper atmosphere, they are important. On the other hand, the mode conversion process can be considered as one of the processes of generating electromagnetic waves that can occur under certain conditions. Usually, propagation waves in an inhomogeneous plasma are a necessary, but not a sufficient condition for a mode conversion process. Snell’s law has an important role in the mode conversion process. Although, this law lets a mode conversion occur from Z- to LO-mode waves, in a case from Z- mode to whistler mode waves, it plays a preventive role.The aim of this paper is to demonstrate the preventiverole of Snell’s law in a mode conversion from Z- to Whistler-mode waves in an inhomogeneous magnetoplasma with a low density. We used the dispersion relation in the magnetoplasma with a low density and for an oblique wave normal angle. By applying the Snell’s law, we showed that with the propagation of the Z-mode waves in an inhomogeneous plasma, there is not any matching point between Z- and Whistler mode waves, and for any wave normal angle always an evanescentlayer exists between the two modes.In this case, Snell’s law prevents the mode conversion from occurring. It also prevents the transfer of energy from one to another mode waves. Inan, U. S. and Bell, T. F., 1977, The plasmapause as a VLF waveguide, J. Geophys. Res. 82, 2819. Inan, U. S., Bell, T. F., Bortnik, J., and Albert, J. M., 2003, Controlled precipitation of radiation belt electrons, J. Geophys. Res., 108(A5), 1186, doi:10.1029/2002JA009580. James, H.G., 1979, Wave propagation experiments at medium frequencies between two ionospheric satellites 3. Z mode pulses, J. Geophys. Res. 84, 499–506. James, H.G., 1991, Guided Z mode propagation observed in the OEDIPUS A tethered rocket experiment, J. Geophys. Res. 96, 17865–17878. Jones, D., 1976, Source of terrestrial non-thermal radiation, Nature, 260, 686–689. Jones, D., 1980, Latitudinal beaming of plantary radio emissions, Nature, 288, 225–229. Jones, D., 1977, Mode-coupling of Z-mode waves as a source of terrestrial kilometric and Jovian decametric radiations, Astron. Astrophys., 55, 245-252. Jones, D., 1988, Planetary radio emissions from low magnetic latitudes observations and theories, in Planetary Radio EmissionsII, edited by Rucker, H. O., S. J .Bauer, and B. M. Pedersen, 255–293, Austrian Acad.Sci., Vienna, Austria. Kalaee, M. J., Ono, T., Katoh, Y., Iizima, M. and Nishimura, Y., 2009, Simulation of mode conversion from UHR-mode wave to LO-mode wave in an inhomogeneous plasma with different wave normal angles, Earth Planets and Space, 61, 1243-1254. Kalaee, M. J., Katoh, Y., Kumamoto, A., Ono, T., and Nishimura Y, 2010, Simulation of mode conversion from upper-hybrid waves to LO-mode waves in the vicinity of the Plasmapause, Annales Geophysicae, 28, 1289-1297. Kalaee, M. J, Katoh, Y., Ono, T., 2014a, Effects of the angle between the density gradient and the external magnetic field on the linear mode conversion and resultant beaming angle of LO-mode radio emissions, Earth, Moon and Planets, DOI: 10.1007/s11038-014-9448-4. Kalaee, M. J., and Katoh, Y., 2014b, A simulation study on the mode conversion process from slow Z-mode to LO mode by tunneling effect and variations of beaming angles, Advances in Space Research, DOI 10.1016/j.sar. 2014.08.025. Oya, H., 1971, Conversion of electrostatic plasma waves into electromagnetic waves: numerical calculation of the dispersion relation for all wavelengths, Radio Sci., 12, 1131–1141. Stix, T. H., 1992, Waves in Plasmas, American Inst. Physics, New York. Storey, L. R. O., 1953, An investigation of whistling atmospherics, Philos. Trans. R. Soc. London, Ser. A. 246, 113.